If you can tear your eyes away from the Royal Pavilion, and look beyond the curvaceous flower beds, tucked away under the trees on the West side of the lawn lies The Pavilion Gardens Café. You probably won’t be surprised to learn that this small building surrounded by tables and chairs beneath an avenue of elms has a history all of its own. This is where Brighton people come for a cup of tea, a rock cake, a gossip with friends or just a quiet sit in the sun. Although it is so close to the Pavilion it is often overlooked by tourists, perhaps because of its quiet location amongst the shrubs and trees at the end of the garden. David Sewell who runs the café is the third generation of his family to do so. Curators come and go, mayors and town councillors rise to office and depart, but this family business just keeps going. It was Adolf Hitler who began it all. The Fuhrer did not come to Brighton in person to bake cakes, but he was threatening to invade Brighton during the war so the small businesses and tea shops on the sea front were given notice to close down. Herbert Tennent was one of those tenants. 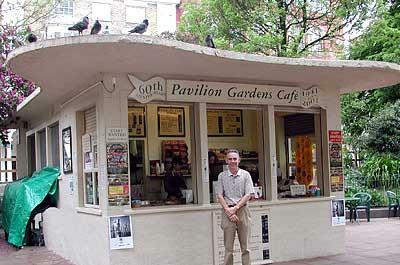 Stripped of his livelihood, in 1941 he approached Brighton Council with the proposal that he open a café just inland on the north side of the Pavilion. Within hours the council sent a taxi round to ask how soon he could open, and they laid a concrete plinth for his tea shop to stand on. Mr Tennent was David’s grandfather, and even when he passed the business on to his daughter June and her husband Douglas Sewell in 1976 he continued to come down every morning and bake cakes until the time of his death. The family still have memories of the old days, when the main London Road ran along the West side of the Pavilion and the East Lawn was covered in deck chairs all summer. Herbert Tennent received coveted invitations to the Mayor’s garden parties held on the Pavilion Lawns, his children roamed the Pavilion watching the craftsmen at work painting gold leaf. 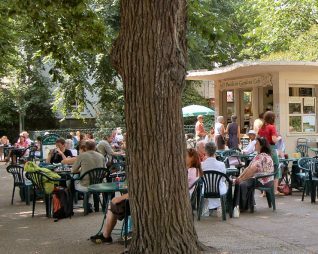 Then in 1950 the café moved to its present location with a more permanent building. So permanent in fact that it is still there today, looking identical. 28 of the sturdy metal tables that Herbert bought in 1950 for the huge sum of £5 each are still in daily use, having been regularly painted and renovated for over 50 years. The Café is open between March and November and is very much a family business run by David and his wife Vanessa with regular daily input from David’s parents. Some of the staff are permanent fixtures as well, Nina has been pouring cups of tea behind the counter for 36 years. It’s all very dependent on the weather of course. On a wet day there is no point in opening the shutters, but all that can change very quickly and if the sun starts to shine the tables fill up in no time. All the regulars know how it works, and quite a few of them come down every day. Mums with push chairs watch their toddlers explore and chase the pigeons in safety. Older people gossip and read the paper as they watch the world go by. For quite a few North Laine residents this is viewed as their back garden if they don’t possess a patch of green on their own property. If you want to see Brighton taking a break from its hurly burly image look here in this quiet little corner of the City centre. Pavilion Gardens Cafe is one of the few cafes in Brighton where good customer service is as important as the quality of the food and drink. What a wonderful insight into the Pavillion Gardens, the writer obviously has a keen passion to keep the readers interested in this website. Well done you – a brilliant page! I am always so sad when winter comes. The cafe closes, people hurry without looking up, and the birds are scavenging for crumbs waiting for the spring when they will get fat bellies again. I adore sitting, having a sandwich and a cup of tea and just watching the world go by. The children playing, old people chatting in the chairs and looking out over a grand Regency style garden and on towards the impressive Royal Pavillion. On a warm day, it’s magical with buskers, students and workers having lunch sitting on the grass. All kinds of people from all over the world meet here, browse, take photos and just sit and watch. I hope it goes on for ever. And, as for me, I am Brighton born and bred and can’t wait for the spring sun on my back and my casual walk to the place of memories and, of course,my cup of tea. Go and enjoy it for yourself and then tell me you didn’t like it. Bet you won’t! I would very much like to thank all our customers at the Pavilion Gardens Cafe once again for supporting us throughout the summer season. 2007 has been an exciting year with the highlight being the Max Miller statue re-doddification in the gardens following the completion of the paving of New Road. Ken Dodd, Michael Aspel, Dennis Norden, Judy Cornwall, Dora Bryan and the Mayor were amongst two hundred invited guests of the Max Miller Appreciation Society making this occasion very special. Ken Dodd what a star – held court as usual cracking jokes and just being his funny self. To see some of the photo’s of this day, visit our website http://www.paviliongardenscafe.co.uk and view the picture gallery 2007. When I was young nobody was allowed on the gardens both at the pavillion and the Old Steine. Everyone could admire them and enjoy them. On a recent visit to the U.K. it was good to see people enjoying their surroundings, it would have been nicer if they would bin their rubbish or take it away with them. Rubbish spoils a beautiful place.